Emily’s Room is a charming story of a bright and unique little girl who transforms an empty bedroom into a beautiful space of her own. 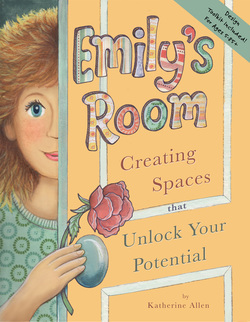 Emily begins to understand more about herself as she explores how she wants her room to look, feel and function. By incorporating her favorite colors, textures, and elements of nature, she is able to create an environment where she can thrive. Tap into your highest potential by designing an environment that enriches and nourishes your life using the same techniques as Emily. Through Emily’s Room, you will learn an intuitive, unconventional method of holistic decorating that is not just about the way a room looks, it's about creating a space where you are at peace, inspired, and supported. A design toolkit that will guide you through your own creative process, from generating ideas to mapping out a personal design plan, is included! Katherine Allen is a holistic, Feng Shui interior designer and lifestyle coach. She is the founder of HarmoniousLivingNow.com, where she helps clients integrate the power of place and Feng Shui with the power of mindset to create harmonious and thriving environments. Katherine writes, speaks and coaches from Boise, Idaho where she lives with her husband, Jim and their daughter Serena. She is also the mother of adult children, Abel and Larissa, and a proud Grandmother of 3 beautiful grandchildren.